This project is culmination of learnings from Research Methods & Fundamentals of User experience courses into an insights report and re-design of the website homescreen and search experience. We worked in collaboration with our client, SVA library and our group comprising of Emily, Karen, Marcelo Matt and myself, focussed on the graduate students and their experience in the library as well as using the website. As a part of our primary research we created a formal discussion guide, sent out a screener to graduate departments, recruited 10 participants and finally interviewed them to learn about their experience using the SVA library and the library website. The discussion guide can be found here. We took these insights and worked on design suggestions to the staff of the library. 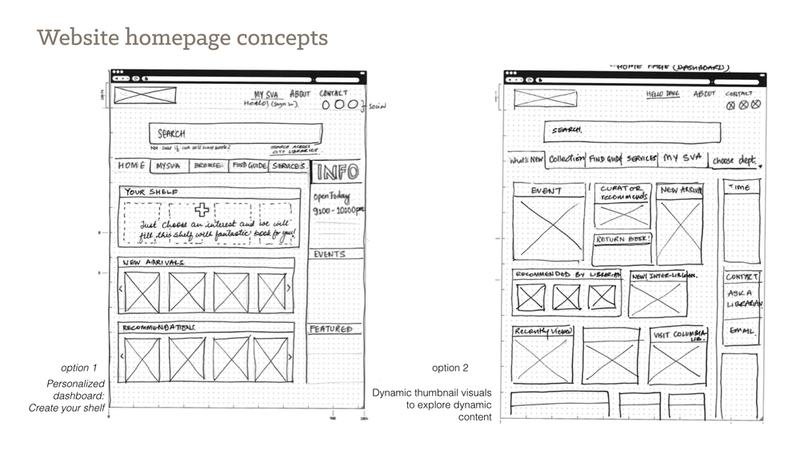 The process included - creating concept cards, user scenarios and wireframes. We also conducted two participatory workshops with the clients to align our design intentions with their goals. 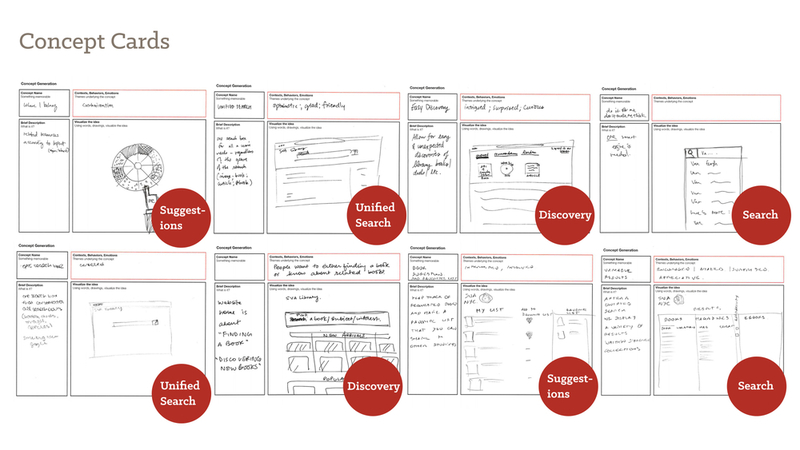 Based on our ideation session we narrowed down on two focus areas ‘discovery on home screen’ and ‘Unified search'. We re-framed our design goal as “Design a home screen experience for library website that would enable discovery of content and simplify content search"
As a next step we created a sitemap to understand the information architecture of the website. This helped us to identify the feature positioning within the site. We also created task flows to flesh out the potential user journey with the proposed system.